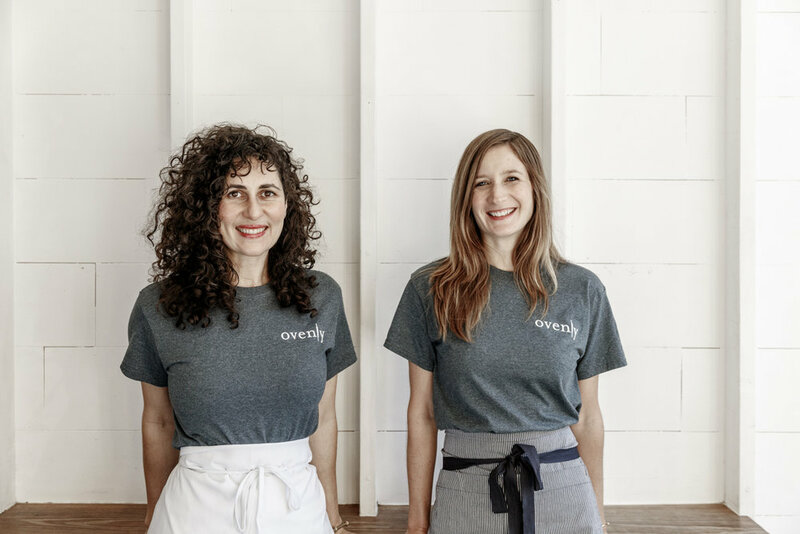 Ovenly, co-founded by Agatha Kulaga and Erin Patinkin in New York in 2010, is an award-winning creative bakery. The inventive sweet and savory pastries are "classic but with a twist". Currently, Ovenly has a robust whole clientele as well as four locations in New York, and it looks to expand nationally. Agatha and Erin also authored their recipe book Ovenly: Sweet and Salty Recipes from New York's Most Creative Bakery. What is your background before co-founding Ovenly? I graduated with a BA in psychology from Boston University and moved to NYC right after. It was around 9/11 so job openings were sparse. I had worked in restaurants from the age of 16 (I typically worked at least two jobs at time), so ended up waiting tables to hold me over. I had always loved being around and working in food, so loved doing it. Then in 2002, I began my career in the psychiatry department at New York University School of Medicine and stayed there for just under ten years. My focus was on mental health and addiction treatment and worked with individuals from all walks of life. During that time, I also received my master’s degree in social work at NYU and was an assistant professor. Throughout it all, I was always been baking on the side. It became a serious side passion and my way to relieve stress. I loved the tactile and sensory element of baking, and it was something that brought me true joy. I went to a food-focused book club that my childhood friend, Cara Cannella, had started called Four Burners. It was held at my (future) co-founder Erin Patinkin’s house, and it just so happened that everyone there already worked in food except for Erin and me. We ended up chatting through the night and decided to meet the following week to talk about starting a food business. At that point, we were both willing and ready to take the leap and knew we were the right partners for it. We continued to meet for about a year, mulled over many ideas and eventually, Ovenly was born. We talked about what we really wanted to do and what Ovenly would be for about a year. We didn’t start with a business plan, although we should have! In that year, we recipe tested, consulted on menu creation, and did some catering jobs. Finally, in 2010, we decided our big business idea was to develop packaged high-end bar snacks that would blow people's minds. We started selling the bar snacks to Brooklyn Brewery and to my friend, Heather, who opened her second cafe and bar. We were confident the bar snacks were going to be a major hit. Then Heather asked if we could also make daytime pastries for her, and naturally, we said yes. The baked goods took off (the bar snacks not so much) and through word of mouth, we suddenly had a booming wholesale bakery business. We barely slept during the first year. We would wake up at 3am to bake until 7:30am, make our deliveries on foot in baskets to our wholesale clients, run to work, come home from work, and bake until midnight. After about six months, we quit our full-time jobs to focus on Ovenly and finally opened our first bakeshop in 2012. How did you develop your recipes? Erin and I both come from Eastern European background where a lot of nut flours and spices are used in baking, so that really inspired many of our recipes. We want to create pastries that have the perfect balance of sweet and salty, so nothing is cloyingly sweet or overwhelming. I'll often have a dessert that’s so decadent that I take a few bites and don't want to look at it again. That is the opposite of we do. We want our pastries to bring people moments of joy to and be a daily indulgence. It’s an experience that brings you a little bit of nostalgia but that also has this unexpected twist in the end. Nothing is too weird or crazy, but we keep people curious and coming back for more. What were the first few pastries that you sold? Our salted chocolate chip cookies, currant rosemary scones, and peanut butter cookies. Those were the first few recipes we started testing and refining. We loved making (and eating them) every day, and they were immediate hits with the masses. Where did you make your pastries before you opened the physical Ovenly location? We baked in our tiny apartment kitchens for a while, which is definitely not legal and there was limited space capacity. Baking trays took up my entire home. As a brand new business, it was hard to secure a manufacturing space that early on. So, we had to be creative. There was a pizza restaurant called Paulie Gee’s that had opened in Greenpoint, and it happened to be closed during the day. We ended up baking out of Paulie Gee’s kitchen for several months, dangerously close to the pizza oven which was not ideal for making things like scones, before finding a rental kitchen in Red Hook. We were there for one year before finding our space in Greenpoint where we built a production kitchen in the back and a retail bakery in the front. That became our flagship location. It took time to scale the recipes. Oftentimes, as you scale a recipe, the ratios of the ingredients change and chemistry affects the final product. As home bakers, we did a lot of experimentation and research as we scaled, but also brought in consultants to help us. We are really intent on never diminishing the quality of our products. As companies grow and scale, it's common for the quality of the products to diminish. Sometimes that has to do with people moving to machinery. It also has to do with a business growing too quickly. Our approach is simple. We aim to always offer the most delicious and consistent baked goods and never cut corners. All of our baked goods are made by hand and we our intent is to scale without ever diminishing quality. Erin and I both spend a great deal of time creating and revamping processes and on training our team. We do quality control checks every day. I'm often in the kitchen to make sure all of our baked goods are being made and baked properly. It requires a lot of taste testing, which I can't say I mind! We have an incredible team that’s trained to know exactly what something should look like from the very start of production to the final product. It’s essential that our customers can rely on us for providing them with the best, most delicious baked goods and an overall joyful experience at Ovenly every day. How did you decide the number of selections? In the beginning, we had a menu that was about four pages long! That was nixed very quickly. Too many options become overwhelming and hard to scale and manage. We always want to create pastries that would attract a diverse crowd but at the same time, we know people are creatures of habit. There are folks who come in and order the same cookie every single day. If we introduce too many new things, people might try them once, but ultimately everyone has his or her favorite treat. We surveyed a lot of our customers and wholesale clients and we really paired it down over time based on our sales and feedback, and what was scaleable without ever compromising quality. How did you find and choose your suppliers? We talked to a lot of people in the industry who generously shared their resources. We are very intent on sourcing responsibly and use all natural, non-GMO ingredients, sourcing our ingredients based on the environmental impact they have. We constantly work to reduce our waste as a business and pay attention to where our ingredients are coming from. Now we have established relationships with our vendors whose values are aligned with ours. Staff education on all of this is equally important to ensure that the values we have as a business are understood and practiced across the company. How did you decide pricing? We didn’t do it properly at the beginning, so we had to back track. In order to really do it properly, we need to understand the business well, and we worked with accountants throughout the years. How did you find and choose your location? I have been living in Greenpoint for 15 years, and Erin lived in Clinton Hill but spent a lot of time in Greenpoint, so we knew the neighborhood very well. We looked at the Greenpoint space, which was under construction, while we were renting our kitchen in Red Hook, but it was nowhere near ready and we were also not financially ready to take the space on. Then, one year later, someone told us the space in Greenpoint was still available, which felt serendipitous. We had just closed on a round of funding, so the timing was perfect and we moved in shortly after. Greenpoint has an incredibly vibrant and supportive community. We have amazing, loyal customers who have been coming here since the day we opened and we have built many lasting relationships in the neighborhood, including within the local business community. Ovenly has four locations, and you look to open more location soon. Why did you choose these locations? We never envisioned Ovenly as a mom and pop shop. We see Ovenly being the neighborhood bakery in every neighborhood. Our second location, which is a kiosk at Urbanspace Vanderbilt, is great because it gives us a presence in Manhattan and exposes us to a different type of clientele. In the past year, we opened up two additional locations in Williamsburg and Park Slope. We are on our way to building a bakery empire! How is the work allocated between you and Erin? In the beginning, we were doing everything together, but we soon realized that it is far more efficient with a division of labor in order to maximize our potential so that we are not both working on the same exact things. These days, Erin manages front of house operations and identifies real estate opportunities. I manage back of house and wholesale operations. We work together on long-term business strategy, business development, company culture, and other creative projects. How did you find your employees? What are you looking for when you hire them? At first, we had so many friends helping us in the kitchen. That changed when we started growing very quickly. As we've matured as a company, we have more resources and more time to seek out the right people who can help us grow our business. For us, it’s less about someone's experience and more about her/his character, enthusiasm, commitment, and willingness to learn. Our aim is to create quality jobs for all people. We have open hiring practices, which means we don’t require a resume to apply for a job. We have relationships with job training and placement partners including the Center for Employment Opportunities, Getting Out and Staying Out, Seedco and the Ansob Center for Refugees. We believe in fostering an empathetic economy and offer employment opportunities to people who are otherwise denied them, such as those who have been formally incarcerated and political refugees. About 40% of our back of house team members are referred from one of our partner organizations, and those folks are some of our shining stars at Ovenly! Erin and I bootstrapped for the first year. We invested the small amount of savings we each had into the business until we received an angel investment from a friend. Then we did a seed round, which helped us build our commissary and open up our first bakeshop. We recently closed on another financing round in 2017. We plan to raise more money in the near future. We are really fortunate that we started our wholesale business first, so we could build up our clientele and brand awareness before we opened up our first retail location. How did you get your wholesale customers? Our first customer was Veronica People's Club, who we sold bar snacks and pastries to. Then another friend opened up a café in Bed-Stuy and wanted to sell our pastries. Soon, our wholesale business was booming simply through word of mouth recommendations for the first three years. We came in at a very opportune time. We didn’t realize it at the time, but there were many high-end coffee shops opening up, but there were no high-quality pastries being offered to match the quality of coffee being served. Pastries at the time were very conventional. When we started, we offered a more diverse flavor palette and the quality of our products was exceptional. One of the people who really helped us launch our wholesale business was Jonathan Rubinstein from Joe Coffee. He had 8 shops at the time and really took a chance on us when he asked if we could make pastries for all of his coffee shops. We were still very small but we were determined to make it happen. That was our first foray into high volume production. We learned how to bake on a larger scale and increased our capacity in a huge way. At that point, we knew we were on way to building something great. We read so many books and resources on business and food, but so much of it was trial and error in the beginning. It was also essential for us to build as many relationships as possible. We reached out to other established food entrepreneurs and sought mentorship from people across many industries. The food community in NYC is incredibly supportive and open to sharing resources. I lost sight of my personal needs. We were going nonstop and burn out is inevitable at the rate we were going for the first two years. The business takes over your life, and you forget what eating well, exercise, and sleep is. It's very hard to see the bigger picture and think strategically when you are running around doing the jobs of 12 people. As soon as we hired some staff, we were able to sleep (at least a little more) and focus more on business strategy and operations. When you start your own company, you can shape the business based on the vision you have, which is empowering and deeply satisfying. This means it's also essential that everything we do is aligned with our values, both personally and professionally. Defining your vision and values will shape the decision-making process throughout the life of the business. Take time to really think about the company and culture you want to create. Work on that vision and rework it on a regular basis because it's going to change a lot! Be sure to identify your company values early on. Those values will help guide decision making around things like company financing, growth, and staffing. Reach out to other entrepreneurs and listen to people's experiences in business as early as you can. Those can be incredible (and free) resources and will help you build a support community. And embrace vulnerability. Don't be afraid to ask for help!